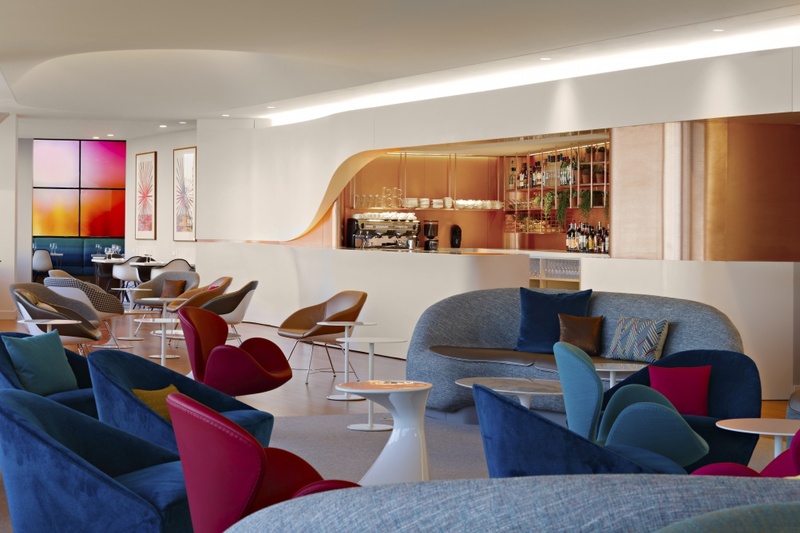 Virgin Atlantic has unveiled a new Clubhouse at Los Angeles International Airport, which reflects the climate, topography, and culture of LA. 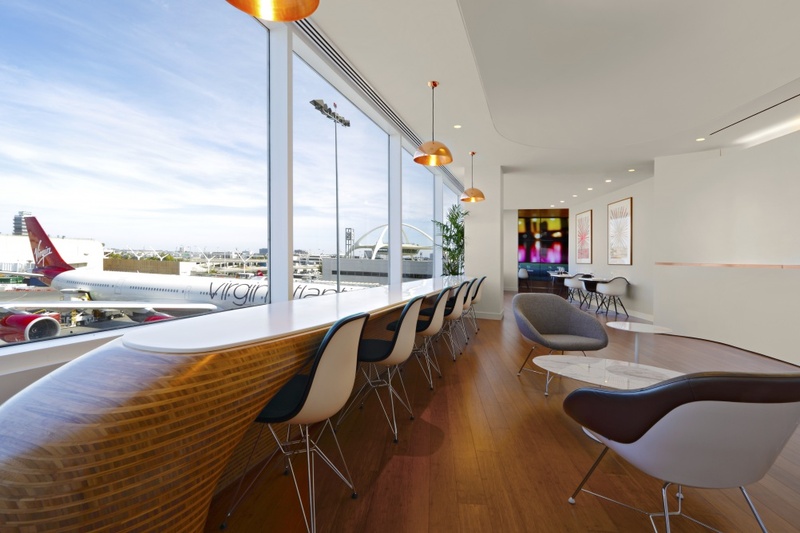 The airline’s in-house team has worked alongside US practice Slade Architecture on the £2.5 million project, engaged local and London-based artists to create bespoke pieces and has chosen furniture by the likes of Californians Ray and Charles Eames that reference LA’s own design history. According to Virgin Atlantic the opening of the lounge is in part a celebration of running its London to LA route for 25 years. Inside the 370m² space a neutral reception area is only highlighted by the red uniform of a staff member at the welcome desk. 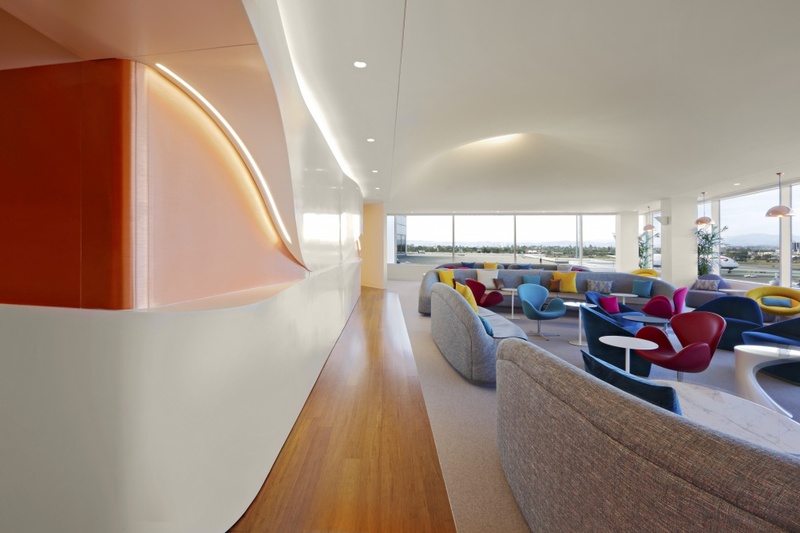 This transient space is designed to provide respite from the busy airport and gives way to the main lounge where an unbroken Corian and copper “Flow Wall” opposes views of LAX’s Theme Building, The Hollywood Hills and the Hollywood sign. Other than a copper Virgin Atlantic sign prior to entering the reception area, the space is entirely unbranded. 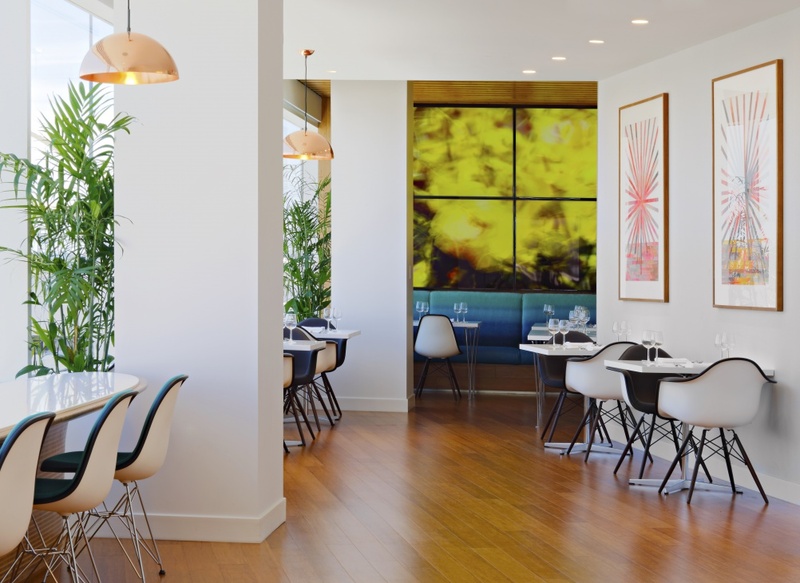 The challenge of the LA lounge was to reference its locality while staying on brand. Brown says the phrase “enlivening your senses naturally” was front-of-mind for the design team, which worked within its own broad guidelines and looked to engender the lounge with the spirit of LA at every opportunity. 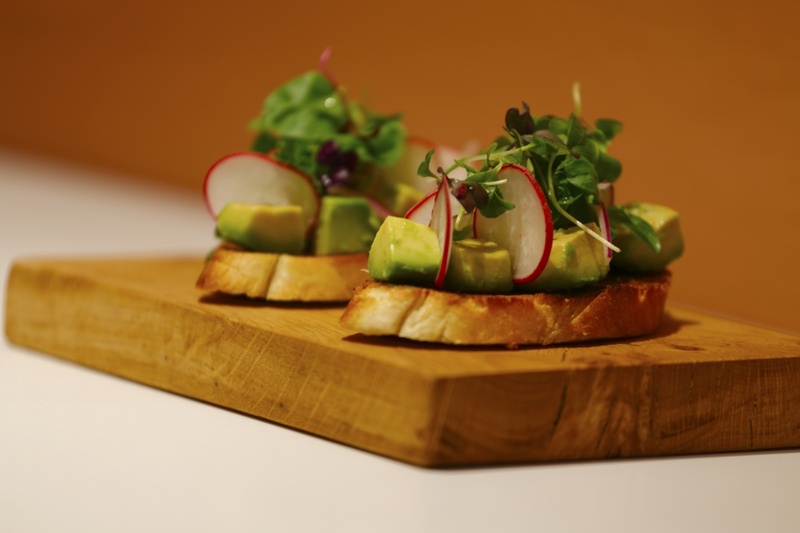 “Even the food and service reflect the healthy living outdoor lifestyle of LA,” he says. Other themes are “warm sunshine hues, unapologetic white spaces, a fondness for natural offerings and getting healthy,” adds Brown. 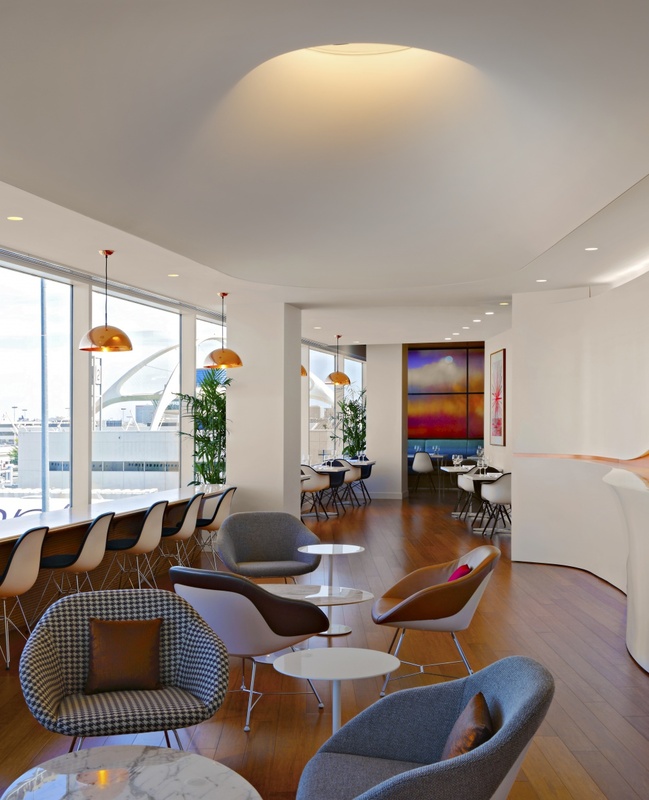 The Flow Wall helps shape one side of the triangular lounge and at the near end sofas and tables by Slade Architecture have been designed to resemble the landscape – dunes and rolling hills in this case, while Swan chairs by Arne Jacobsen complete the look. 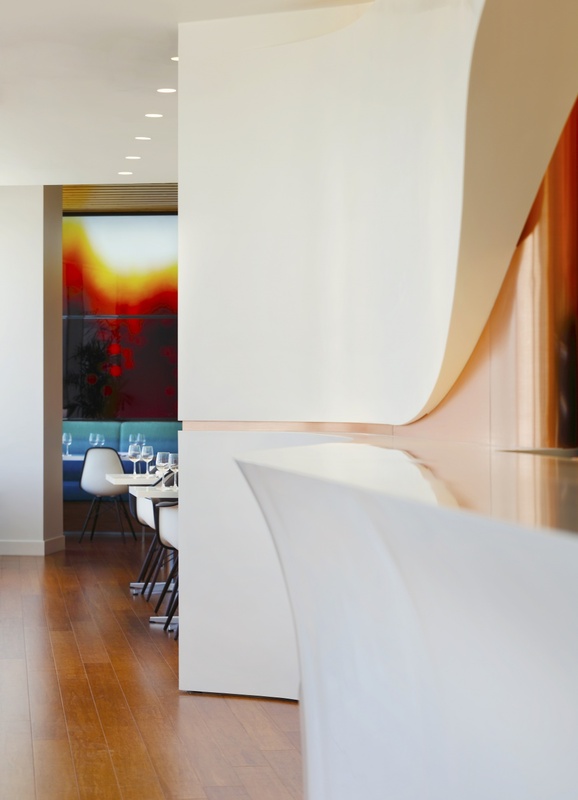 A sculptural fabric ceiling abuts the Flow Wall and is described by Brown as “beautifully amorphic”. Integrated into the Flow Wall a copper lined bar is furnished with native Californian plants and stocked with local produce. It is offset by furnishings such as Walter Knoll Turtle chairs and a surfboard-inspired counter by the windows is made up of a layered bamboo plinth supporting a Corian table top. 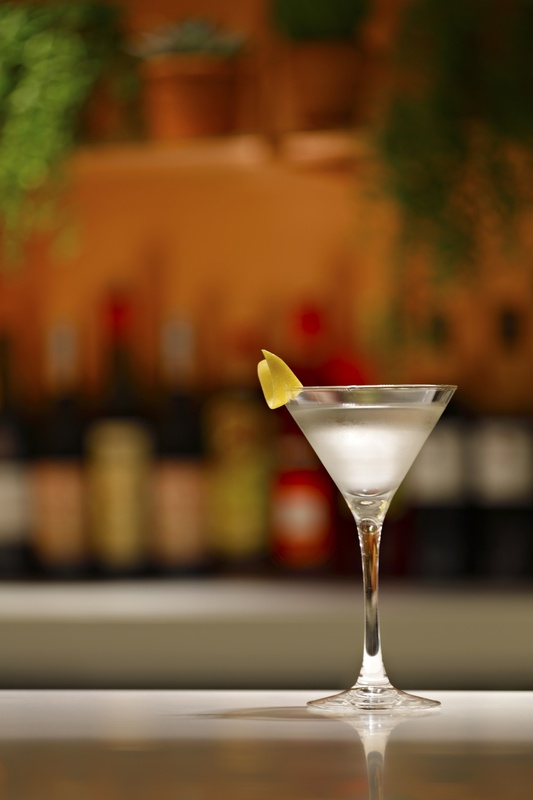 It also takes cues from skateboards, boat hulls and polished beach stones. 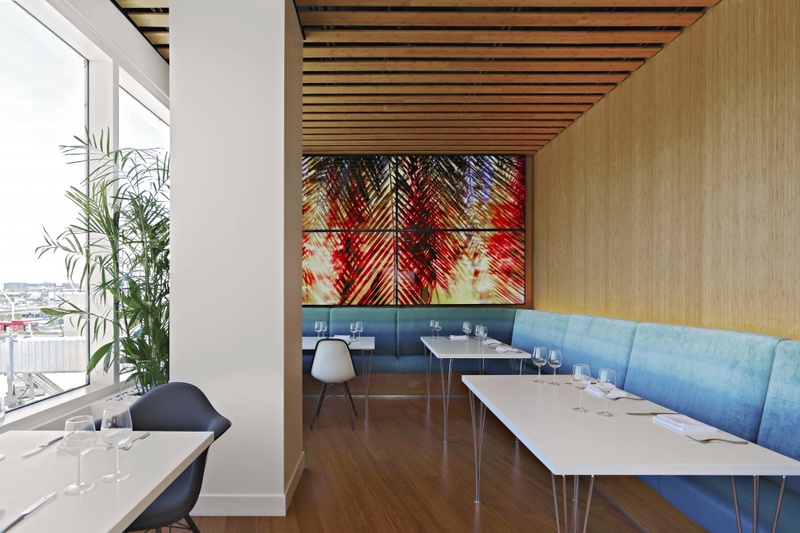 At the apex of the Flow Wall bamboo lines the wall and ceiling, framing an immersive piece by digital artist Diana Reichenbach who says she likes to communicate personal introspective moments in an attempt to capture the viewer’s attention. “For this commission I wanted to engage Clubhouse viewers in the beautiful setting of Los Angeles through shifting lightscapes, subtle movement and vivid colour,” says Reichenbach, who until recently lived in LA. Reichenbach’s piece is on a half-hour loop and has been designed so that its colours complement those of the interior – particularly copper and hot pink as well as greens and blues. Virgin designer Emma Lally helped steer Reichenbach’s design so that it was on brand and fitted into the context of the space. At the most northerly part of the space British artist Vic Lee has created a hand-drawn mural, he calls LOLA – “To London with love Los Angeles.” The piece references both cities with playful typographic cues. Lee, who spent time in LA for the project, says “I immersed myself in LA culture out here.” The tattoo-style piece also draws on “witticisms and Victorian prose” he adds. It took him four-and-a-half days to create on site using graffiti pens, black ink and acrylic paint. Craft is finally on the agenda, but how can we keep it there?